The Russian Embassy in the US changed a tweet about a meeting between Sen. Rand Paul and the Russian ambassador to the US. After deleting an initial tweet about the meeting, a subsequent tweet omitted references to improving US-Russia relations. Paul’s office said the meeting was primarily focused on cooperation between the two countries on security challenges. The Russia Embassy in Washington, DC made a questionable change to a tweet it sent out on Wednesday about a meeting between Russian Ambassador to the US Anatoly Antonov and Sen. Rand Paul. The embassy initially tweeted out a photo showing Paul and Antonov with a caption that indicated they had discussed strengthening ties. 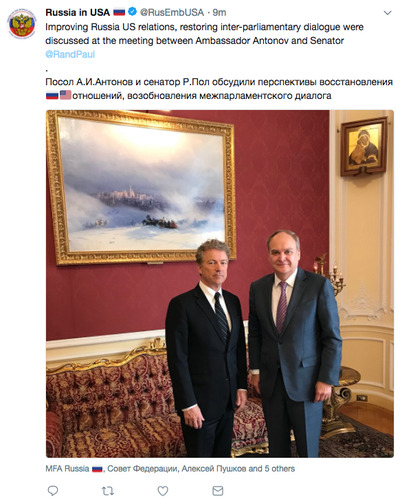 “Improving Russia US relations, restoring inter-parliamentary dialogue were discussed at the meeting between Ambassador Antonov and Senator @RandPaul,” the initial tweet read. But several minutes after this tweet went out, it was deleted, and the embassy quickly posted another tweet that, while featuring the same image, had a somewhat different message attached to it. “Russia US relations, inter-parliamentary dialogue, regional & global security issues were discussed at the meeting between Ambassador Antonov and Senator @RandPaul,” the new tweet stated. Omitted from this new message were the words “improving” and “restoring,” and language about security issues had been added. A spokesperson for Sen. Paul told Business Insider that the meeting had primarily been about these security issues. “As a member of the Senate Foreign Relations Committee, Senator Rand Paul regularly meets with ambassadors. Today, Senator Paul had a productive meeting on enhancing cooperation as it relates to combating terror and reining in North Korea,” a Paul spokesperson said. Paul’s routine visit to the embassy comes at a time of increasing tensions between Russia, the US, and American allies in Europe like the UK, and President Donald Trump came under fire on Tuesday for a congratulatory call he made to Russian President Vladimir Putin about his recent re-election. While Trump has frequently asserted that close relations with Russia are “a good thing” even members of his own party, like Sen. Ben Sasse, have come out swinging against his refusal to criticise the Russian leader. “The White House refused to speak directly and clearly about this matter; we were weakened as a nation and a tyrant was strengthened,” Sasse said on Wednesday. In such a charged environment, seeking to “improve” or “restore” relations between the US and Russia can be controversial, even if the cooperation is limited to security concerns. While the Russian embassy could not be reached for comment, it is possible they too felt the need to tread lightly about such a high-profile meeting.